IISc Bangalore M.Design Admission 2018 application form is available online from 1 February 2018 and the candidates can fill the application form by 26 March 2018(11:59 PM). Master of Design is a Post Graduate educational Degree. Candidates willing to apply for this course must have cleared the Common Entrance Examination CEED. IISc Bangalore M.Design Admission 2018 will be conducted by IISc Bangalore. Get the complete details on IISC Bangalore M.Design Admission such as eligibility criteria, application process, selection process etc. About IISc: IISc had begun its journey with 2 departments and 21 students in 1911, and now it has 39 departments, units, or centres, 3500 students, and about 500 academic and scientific staff, supported by 600 administrative personnel. IISc Bangalore is the premier institute for advanced scientific and technological research and education in India. The institute offers M.Design program through Centre for Product Design and Manufacturing. Master of Management (M Mgt). Academic Qualification: Candidate must have Bachelor’s degree in Architecture/ Design to pursue the M.Design course. Qualifying Exam: Candidates who are applying for this programme should qualify in CEED 2017/2018. The application process has been started from 1 February 2018 at the official website of IISc. The candidates have to fill the online application form for the admission. The candidates need a valid CEED score to apply for the admission in M.Design in IISc Bangalore. However, the candidates also need to fill the separate application form of IISc Bangalore M.Design. The application form of IISc Bangalore is divided into four sections such as Personal Details, Preference of Departments, Details of qualification, and Application Fees. Each section will be open in a separate tab. The candidates are provided with the steps to fill the IISc Bangalore M.Design application form. The admission will be done on the basis of CEED scores although the candidates are required to fill the IISc Bangalore M.Design application form. Candidates are advised to follow each and every step carefully to ignore the mistakes while filling the application form. The Candidate has to fill his/ her personal details such as Name, DOB, Gender, Nationality, etc. The Candidate has to upload his/her photograph in jpeg, gif, tiff, or png formats. The Photograph should not exceed 1 Mb. The scanned image of candidate’s signature also needs to be uploaded in jpeg, gif, tiff, or png formats. The scanned image of candidate’s caste/ PH / KM certificate also requires being uploaded in png, gif, tiff, or png formats. In this section, the candidate has to select his/ her qualifying degree and branch of qualifying degree. If the candidate qualified CEED 2017/ CEED 2018 examination, then they have to provide the Roll Number and marks (out of 100). In case the candidate is qualified in both the years of the CEEC exam, then the higher of the two marks will be considered. After completing above mentioned steps, fee amount will be displayed automatically as per candidate’s category. Pay the application fee through Online Mode: Candidate can pay the application fee through Net banking, Visa Card/Master Card, Debit/Credit Cards. The application link will take the candidate to the selected banker’s website after the transaction is complete, the candidate will be redirected to the IISc online application page to “Submit” the online form. In case the link did not redirect. If the link did not get back to the IISc online application page, the candidate will have to wait for 24 hours from the date and time of the transaction for us to update the link. Candidate can preview & edit his/ her application form by clicking the ‘Preview your Application form’ button and ‘Edit’ button. If the candidate is satisfied with the application form, press “Confirm to Submit” Button (This will give the PDF of your application form, store it carefully for the records). Certificate/ Mark sheets of Class 10, 12, UG Degree/ PG Degree. IISc Bangalore M.Design Application form has to be submitted online only. There is no need to send the application form or any other document to the Institute. However, the candidates are advised to take the printout of duly filled application form for future use only. The candidates are advised to ensure that the details filled by them are correct in all aspect before the final submission. The application once submitted can not be edited. The IISc M.Design Course Fee given below is for the different categories which include the General, OBC, SC and ST category. The programme fee details for each category is separately given below. Firstly, the candidate’s screening will be based on his/her score of CEED entrance examination, then the further selection will be based on design aptitude test and interview that will be conducted by the Institute from 14 to 16 May 2018. The candidates can check the result for CEED by following the link below. IISc Bangalore M.Design Test and Interview Result- Shortlisted candidates for aptitude test/ interview will be informed on the candidate's interface under 'Application Status' on IISc official website at least 2 weeks in advance. Candidate can take a printout of interview letter from the candidate’s login page. No separate communication will be sent by post. Candidates have to make their own arrangements for travel and accommodation if they called for test/ interview. Offer Letter: The offer letter for the selected candidates will be posted under Application Status of the candidate on the official website of IISc Bangalore. when available, the candidates can download the offer letter. Candidates admitted to M.Des programmes will have to report to the Institute for completing admission formalities on 24 July 2018. 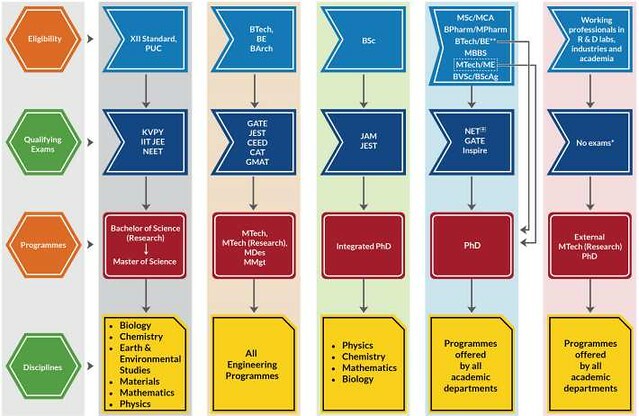 The selection process for the admission in IIsc Bangalore M.Design is divided into three stages. The stages have been described below. Stage 1 (Merit List): Selection will be done on the basis of CEED aptitude test and the candidates will be further selected on the basis of the test. SC/ST candidates should bring the original caste/tribe certificate, issued by a competent authority for purposes of verification. OBC candidates belonging to non-creamy layer/minorities (as listed in the Central list) will be required to produce the original certificate issued by a competent authority. Physically Handicapped candidate and Kashmiri-Migrants should produce the original appropriate certificates, issued as per Government of India rules. After submission of all the mark sheets and degree certificates issued by the Authorized University, the candidate will be given regular admission. CEED is a design entrance exam for admission to Masters of Design (M.Des) & Ph.D. and is accepted by various premier institutes of the country. The admission in the IISc Bangalore M.Design programme will be done on the basis fo CEED scores. Therefore, the exam pattern of CEED for the candidates is given below. The IISc Bangalore also offers the scholarship to the candidates who are academically brilliant. Candidates who are given provisional admission are eligible for a scholarship only on regularisation of admission. The details of the scholarship offered by the institute are given below. All candidates are eligible for IISc Bangalore scholarship/ fellowship from CSIR/ UGC/ DBT/ ICMR/ MHRD/ AICTE/ DAE (NBHM)/ DST. Candidates who are given provisional admission are eligible for a scholarship on the production of the required documents. Students can avail the scholarship from the date of their joining. However, the scholarship will not provide to those candidates who receive a salary from their Employers/ Sponsors. The maximum period of scholarship is 2 ½ years. Some of the established companies such as GE/ INFOSYS/ IBM/ HP/ TATA/ PHILIPS/ BELL LAB/ MICROSOFT/ Department of Electronics and Information Technology also provide scholarships to the deserving candidates.